The wonderworking icon of St. Marina of Maistros was a family heirloom of Irene Abatzis. 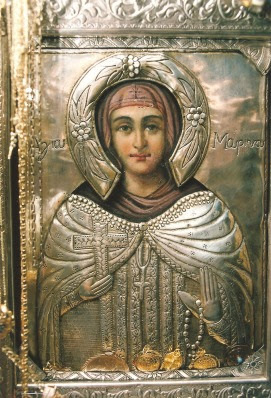 When she died on 21 September 1932, her daughters Smaragdis Karageorgiou, Katherine Bousdrouki, and her son Demetrios Abatzis, at the suggestion of Metropolitan Gervasios of Alexandroupolis, gave the holy icon to the church of the village. 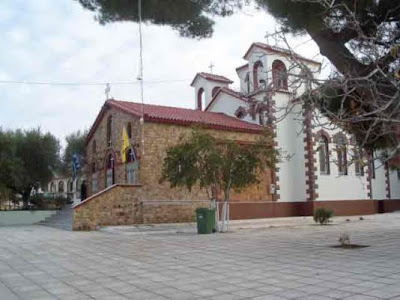 From that time the Holy Church of St. George of Maistros also became associated with St. Marina. Irene Abatzis, following the death of her husband T. Abatzis in 1911, left Kessani with her three children and settled in Maistros next to her relatives, where she occupied herself in needlework. Immediately the miracles began to occur at this time. Irene noticed that the icon of St. Marina would begin to weep every time an unpleasant event in the region of Greece would take place. These tears had healing properties. So when believers from the areas of Maistros and Ainos heard about this, they would come to Irene's home to partake of the grace given to St. Marina. Among the faithful were also Muslim Turks who heard of the miracles of St. Marina and came to receive a blessing. This resulted in not only many miracles among Christians, but also among Muslims. Irene Abatzis would fall into a deep sleep during this time, which lasted sometimes beyond a whole day. The first time this happened Irene's family thought she died, so they began to lament her, until she finally awoke and informed them that St. Marina took her to places that she could never have even imagined. She would recount events that had happened, or had not been known, or would soon take place. There are many testimonies from residents that these things took place as Irene beheld in her visions. After the uprooting, Irene Abatzis with her fellow villagers of Maistros were installed 3km northwest of Alexandroupolis. 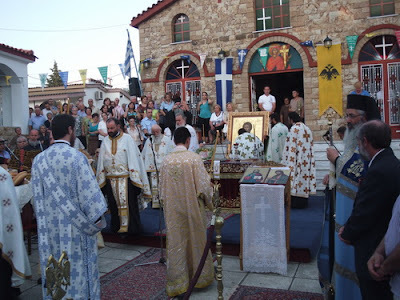 The wonderworking icon of St. Marina was not only a family heirloom, but a collective emotional connection of the Maistros community and the other refugees of Ainos. The people would still bring their sick, whether they were sick physically, spiritually or mentally, to the holy icon to seek healing from St. Marina. Many are witnesses of Irene consoling the sick, who were in an acute crisis, sometimes with her prayers and sometimes with her imperative voice, but always with love and care. She would often receive, according to reports, many attacks, especially from the demon possessed, but she never came to any harm, but rather, they would calm down and be obedient after a forty-day stay in her home. 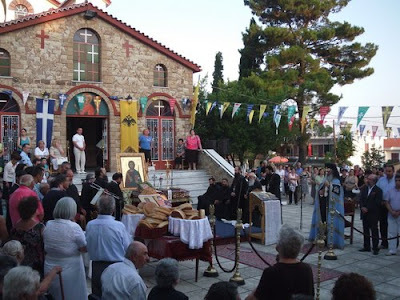 From 1925 and onwards, residents of Alexandroupolis at first, then Evros later, would arrive to worship and celebrate on the feast of St. Marina on July 17th. So in Maistors a great feast would take place with large crowds coming to venerate the wonderworking icon of St. Marina. The festival continues to take place today, together with the ever-growing reputation of the wonderworking icon of St. Marina. Source: Εφημερίδα «Πολίτης της Θράκης» (12-07-2006). Απόσπασμα από άρθρο της Αικ. Κάλτσου. Translation by John Sanidopoulos.